Normally today would be our 31 Day nail art challenge post, but since Deborah is away on holiday for a bit we will do the glitter nail challenge next week and I will be writing a couple of extra posts for your enjoyment this week. Shown here is 3 coats of China glaze Liquid crystal. 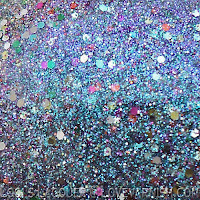 Glitter and duochrome mixed into one polish, awesome! This was 3 coats without a base colour, and with a nice coat of topcoat. The polishes from this collection dry quite smooth though for a glitter, which is nice. They remove just as horrible as any other glitter (yay for peel-off basecoat! ), but this one is definitely worth it I think! Wow, this is too gorgeous!